Do you have those moments where you simply have to create something spectacular and over the top delicious? This past weekend I couldn’t stop thinking how much I wanted to make a very special cake. Not for anyone special other than myself. I just wanted the satisfaction of producing a cake I’d be proud of! Since I had 6 over ripe bananas sitting in our fruit bowl I decided to make a banana cake. I’d thought of adding chocolate chips to it, but then decided I’d rather drizzle chocolate over the top. Since bananas, cream cheese, chocolate and peanut butter all marry well together, I decided to incorporate each into my spectacular cake. I love banana cake with cream cheese frosting. I wasn’t quite sure though how drizzling chocolate over the cream cheese frosting would work or even taste, but decided to try it anyway. 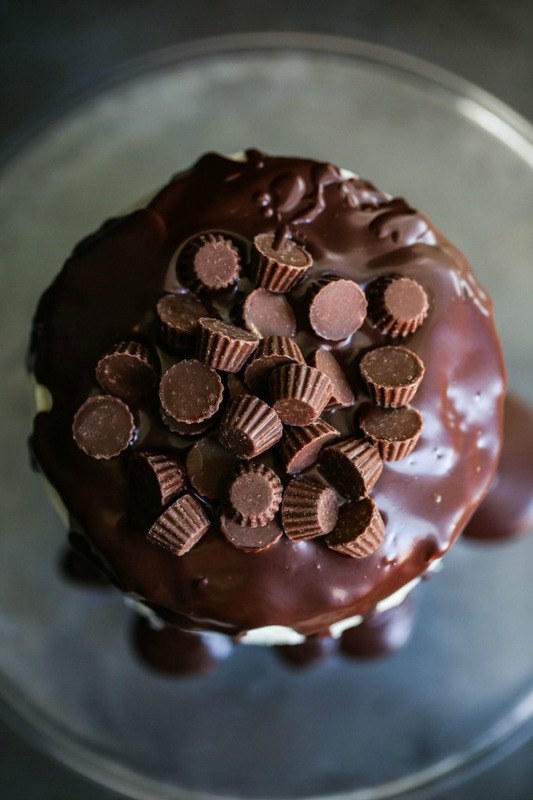 The finishing touch would be to use mini Reese’s Peanut Butter Cups as a garnish so to speak, on top of the cake, similar to adding a bride & groom as the final touch to a wedding cake! OMG, the cake couldn’t have turned out better! I was so happy with my creation, and terrified at the thought of trying to cut into it. The cake ended up being 9-inches tall after using three 6-inch cake rounds. Thank goodness it didn’t fall over! I made my cake in 2 days. On Sunday I prepared the three cake pans and made the cream cheese frosting. This way on Monday all I needed to do was ice the cake, refrigerate, make the ganache to cascade over the top and sides with the final touch, Reese’s Peanut Butter Cups on top. It was perfect! 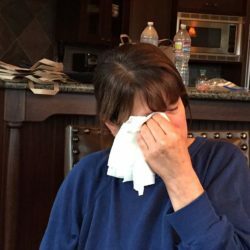 I wasn’t a slave to the kitchen either day, but did my main prep work and cooking on Sunday. The results as you can see were stellar!!! I’m so proud of this little, but very tall cake. It’s moist, delicious and full of flavor. 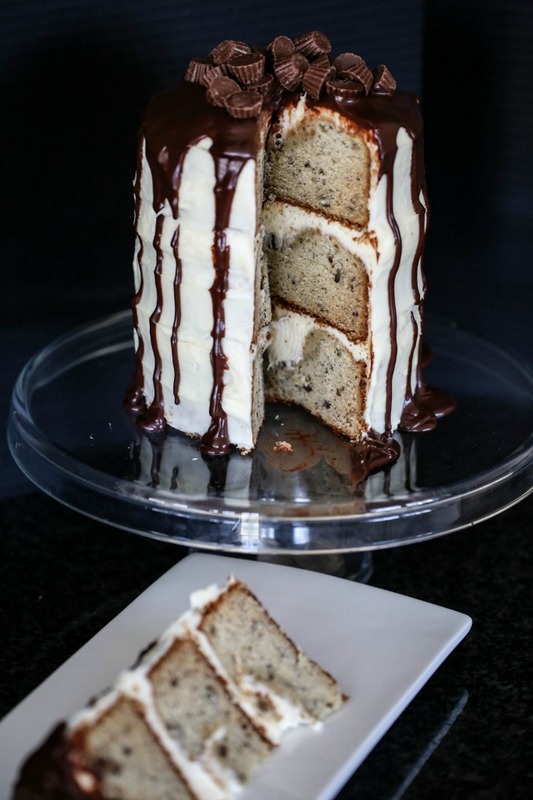 If you or someone you know is a fan of these flavors you definitely need to try my Mile High Banana Cake with a Cascading Chocolate Ganache – you won’t be disappointed! 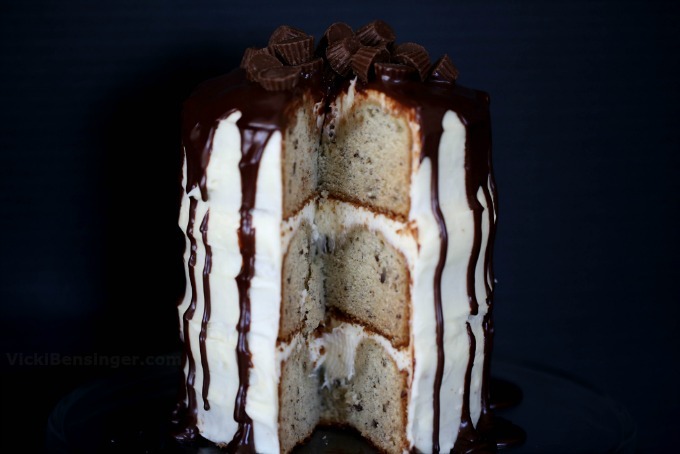 My Mile High Banana Cake with a Cascading Chocolate Ganache is as heavenly to look at as it is to eat! CAKE: Cream butter and sugar well. Add eggs one at a time, beating thoroughly after each addition. Mash bananas and mix in the baking soda. Add to creamed mixture. 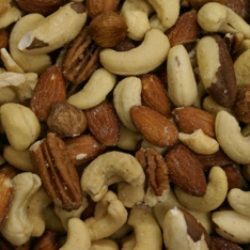 Add nuts. Sift flour with salt and baking powder. Add to banana mixture, alternating with buttermilk. Beat until smooth. Grease three 6x2-inch cake pans and divide batter among them. Bake at 350F degrees for 20-30 minutes or until a toothpick inserted in center of cake comes out with clean, or top bounces back when pressed. Cool. FROSTING: Beat cream cheese, 1 1/2 cups powdered sugar, butter, and vanilla. In another bowl whisk cream and 1 cup powdered sugar to firm peaks. Fold in cream cheese mixture. Chill 1 hour or until firm but spreadable. (I made one day ahead and refrigerated until ready to frost cake). 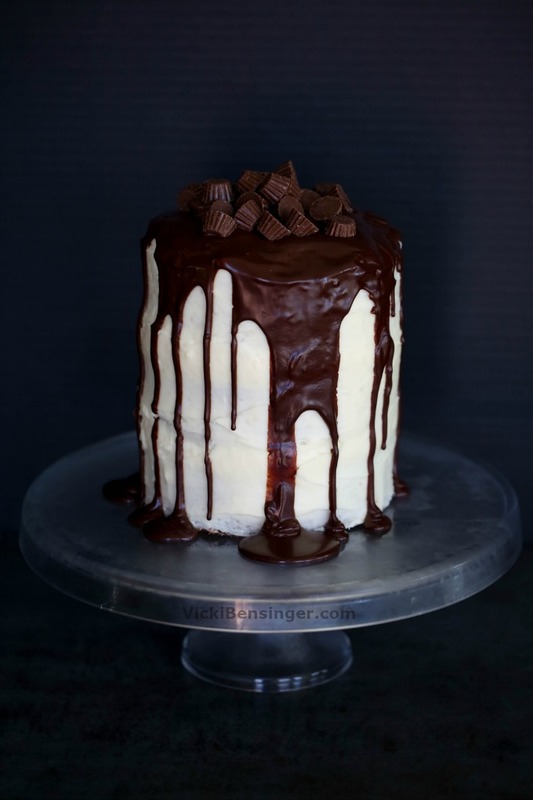 CHOCOLATE GANACHE: (This step should be done just prior to frosting entire cake). Place chocolate in a medium bowl. Heat cream for 1 minute in microwave or in a small saucepan over medium heat, until very hot and just beginning to steam. Pour the hot cream over chocolate and stir until melted completely. Stir in syrup and vanilla. Pour ganache into a medium pitcher or measuring cup, allow to cool for 10-20 minutes. 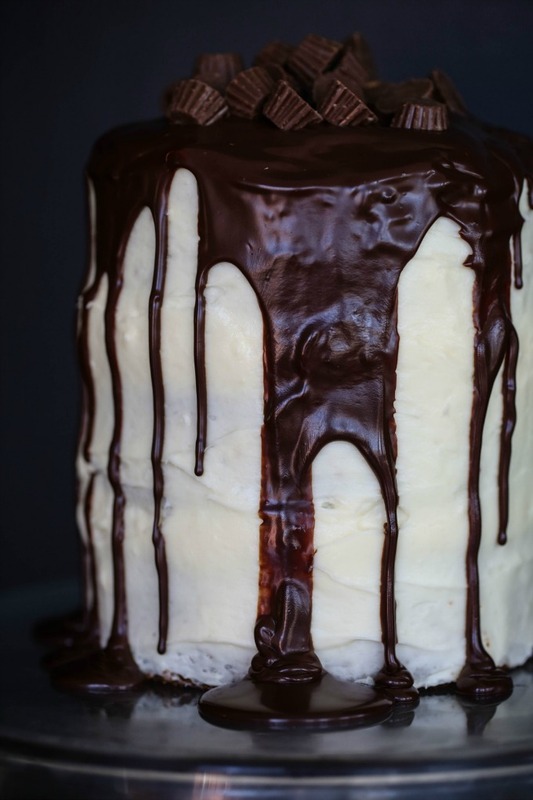 Do not let the ganache sit longer or it can stiffen becoming difficult to pour over cake. ASSEMBLY: Place one cake layer onto a cake plate and top with approximately 1/2 cup frosting. (You'll need enough for 2 layers, light crumb coat, plus frosting cake). Place second cake layer on top of first layer and frost. Top with final cake layer - can be bottom side up or right side up. I did mine right side up. Crumb coat the cake: this is simply applying a very thin layer of icing on the cake to seal in the crumbs. 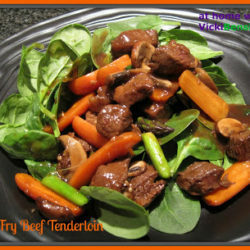 Place in refrigerator 1 hour or overnight. Frost entire cake with a simple smooth or stroke effect. 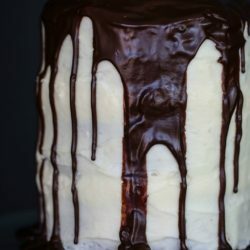 After Chocolate Ganache has cooled - starting in the center of the cake, gradually pour ganache until it starts to cascade down sides of cake layers. You will have some leftover ganache that can be stored in a sealed jar in the refrigerator for another use or to add to cake slices, if desired. Serve immediately or refrigerate until ready to eat. Sharing on Desserts Required’s FB page tomorrow. Thank you Betsy I appreciate that. I hope you’ll try making it. wow this is a stunner! I love just how tall and beautiful the cake looks! Thank you Angie, and it was sooooo good too! Yummy……….It’s Very delicious and tender! Yes it was! I hope you’ll try making it. This is definitely a showstopper, Vicki! From the moist, yummy banana cake to the decadent frosting to the ganache drizzle, every detail is perfect!! Thanks John I appreciate that. Yes it was over-the-top good and disappeared quickly! 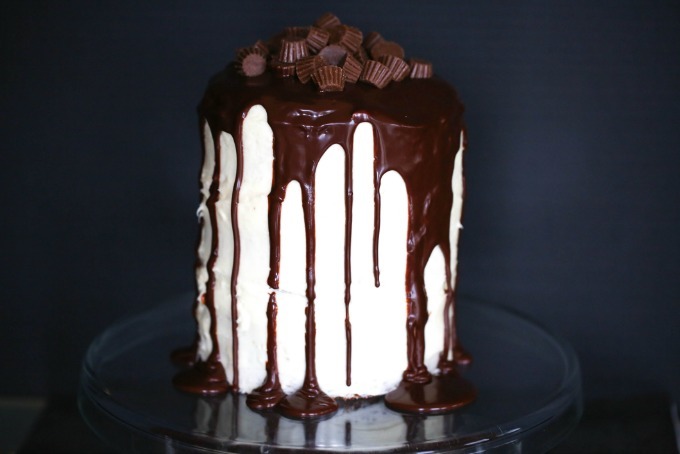 Wow Vicki…what a nice cake…I am loving the chocolate cascade…very pretty! Thank you Juliana. I hope you enjoy your week as well. Thank you Susan. It would still taste delicious if it were shorter but definitely wouldn’t have that same WOW effect! Oh My! 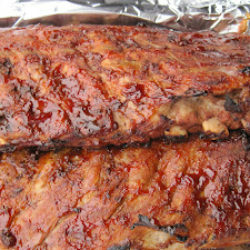 My mouth is watering and my stomach is growling! What a gorgeous cake and I’m sure it’s as delicious as it looks. Thank you MJ, and yes it was definitely tasty!